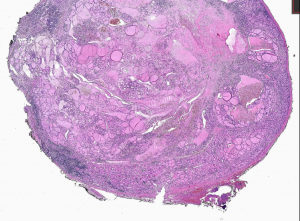 The debate surrounding integration and interoperability in digital pathology has most likely already experienced its peak at present moment. While the focus of the digital pathology debate has now gradually shifted to deep learning, the predominant concerns about security and high costs still characterise much of the conversation. A more profound understanding of why a single standard should be introduced in pathology imaging becomes increasingly important as digitalisation of the sector becomes more widely accepted. Cost concerns are very reasonable, since implementation requires large investments, and without a clear strategy a return on investments is difficult to realise. Though saving money on slide storage is a prosperous future perspective, the current reality of large data formats imposes a challenge. Our Pathology solutions support the standard format (DICOM, the same standard as radiology), and proprietary formats, such as Aperi, Glissando, Hamamatsu, Leica, MIRAX, Philips, Sakura, Trestle, Ventana. If new devices appear, we may add support for them.